Today marks one month until Christmas Eve. Crazy, right? 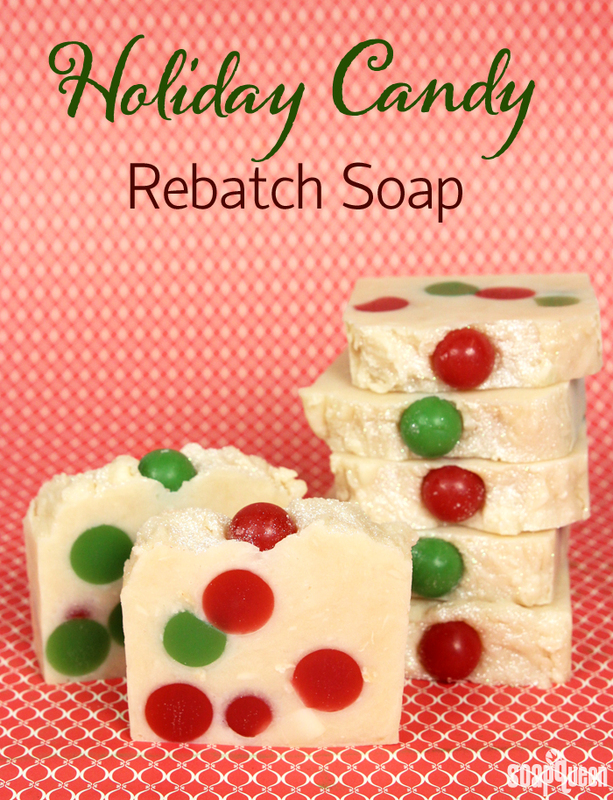 If you’re feeling a little stressed for time to make gifts for the holidays, rebatch soap is here to the rescue! 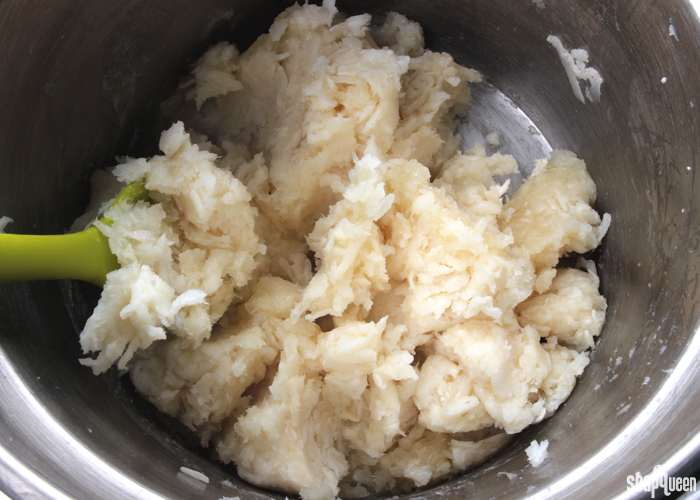 Rebatch soap involves melting down shredded cold process soap with a small amount of additional liquid. 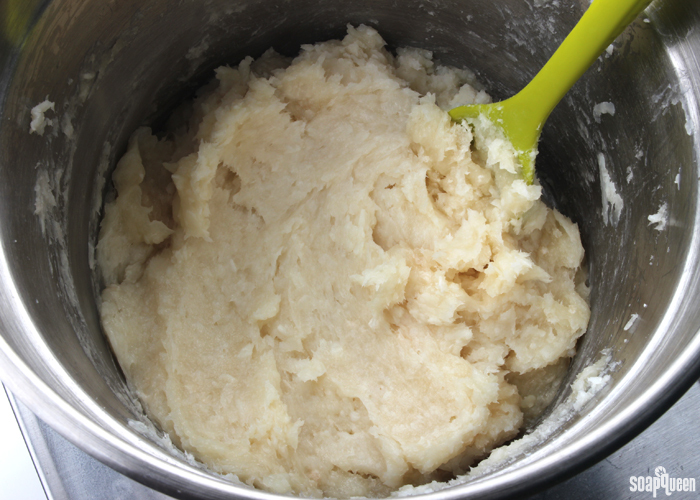 Once melted, the soap becomes a thick, mashed potato-like texture that can be customized with fragrance and color. Rebatching is great if you’re in a time crunch, because it does not require a 4-6 week cure time like cold process soap does. If you’re unfamiliar with rebatch, check out this Soap Queen TV video to see the process in action. This recipe uses Basic Rebatch but there are all kinds of specialty rebatch bases to choose from, from goatmilk to palm-free to shea butter. This Holiday Candy Rebatch recipe uses classic holiday colors, sparkle and embeds to create a super festive bar. Scented with a combination of Holiday Candy Fragrance Oil and Peppermint Essential Oil, these bars smell sweet and minty. The embeds are made with LCP Clear Melt and Pour to help prevent glycerin dew, click here to learn more. If you prefer, you can also use cold process embeds within the soap. To help avoid the embeds from melting within the soap, add them right before plopping the soap into the mold. PREP EMBEDS: Chop and melt 16 oz. of LCP Clear Melt & Pour Soap in the microwave using 20 second bursts. Once melted, split the soap evenly into two containers. 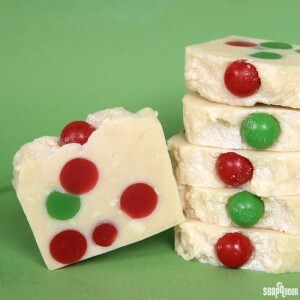 To one container, add shavings of the Perfect Red Color Block until you achieve a rich red, and to the other container add shavings of the Chrome Green Color Block until you achieve a deep green.Carefully pour the soap into the Small 9 Ball Silicone Mold cavities, spritzing the soap with alcohol after each pour to disperse bubbles. Allow the soap to fully cool and harden, then remove the embeds from the mold and set aside. Each color should make 36 sphere embeds, for a total of 72. If you’d like to make less you can, the soap will just not contain as many embed details on the inside. Note: Depending on how many Small 9 Ball Silicone Molds you have, you may need to make the embeds in batches. We recommend melting and coloring all the soap at once so the embeds are a consistent color, and reheat the melt and pour as necessary. FRAGRANCE PREP: Add 1 oz. Holiday Candy Fragrance Oil and 1 oz. Peppermint Essential Oil 1st. Distill into a glass, fragrance oil safe container. Set aside. ONE: In a crock pot or double boiler, heat the Basic Rebatch and 4 oz. distilled water over low-medium heat until it reaches the consistency of mashed potatoes, stirring frequently to ensure the soap heats evenly. Be patient, this process can take a while! The rebatch is starting to melt but is still quite thick. The rebatch is becoming smoother, it’s almost done! Just a few more minutes of low heat and stirring. TWO: Set aside 10 embeds (5 of each color) to apply to the top of the soap. Once the soap is smooth and soft (it will still be quite thick) turn off the heat. Add the fragrance and essential oil blend and stir until completely mixed. 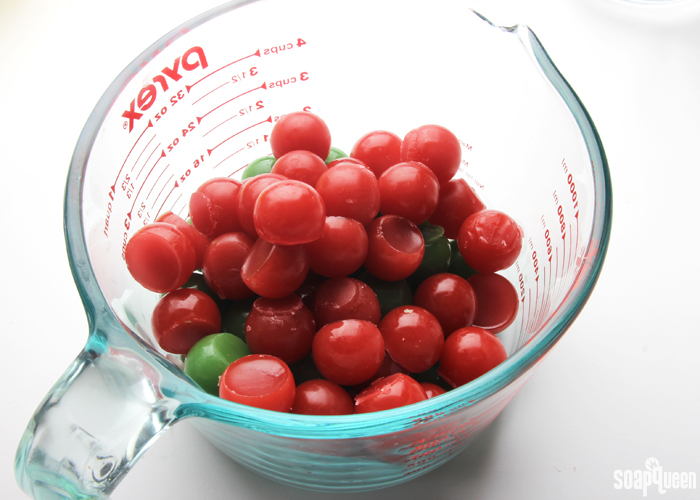 THREE: Add the remaining melt and pour embeds and stir to fully mix them into the rebatch. 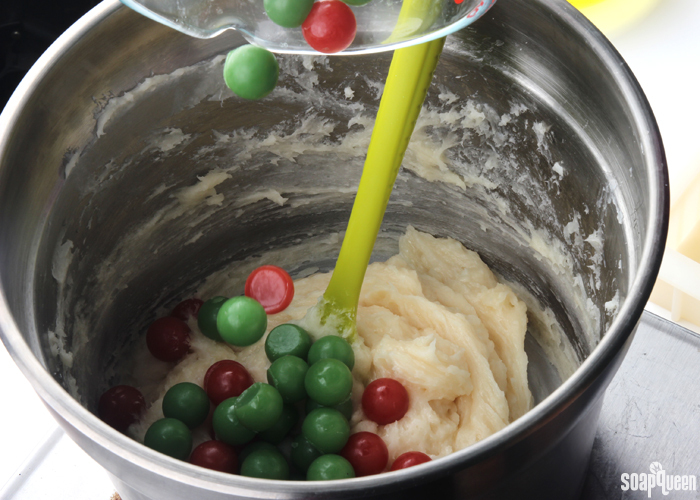 FOUR: Using a large spoon or spatula, begin adding the rebatch into the 10 Inch Silicone Loaf Mold. After every few additions of soap, tap the mold firmly on the counter to help evenly disperse the soap and get rid of any air pockets. Continue adding the soap until the mold is full. FIVE: Use the spoon to mound the soap toward the center of the mold. If any embeds are showing, press them down further into the soap. Once your happy with the top, sprinkle the top of the soap with Snowflake Sparkle Mica. SIX: Place the 10 embeds that were set aside earlier into the center of the soap. Press them down firmly, as this will prevent them falling off the soap later on. SEVEN: Allow the soap to stay in the mold for 4-5 days. Once it’s ready to unmold, cut into bars and allow the soap to cure for at least a week. This allows the moisture to evaporate, creating a harder and longer lasting bar. Enjoy! 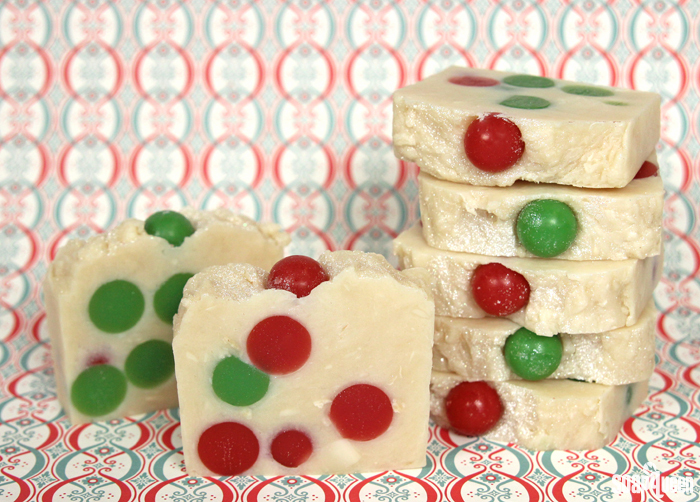 This Holiday Candy Rebatch looks super festive, and smells delicious! 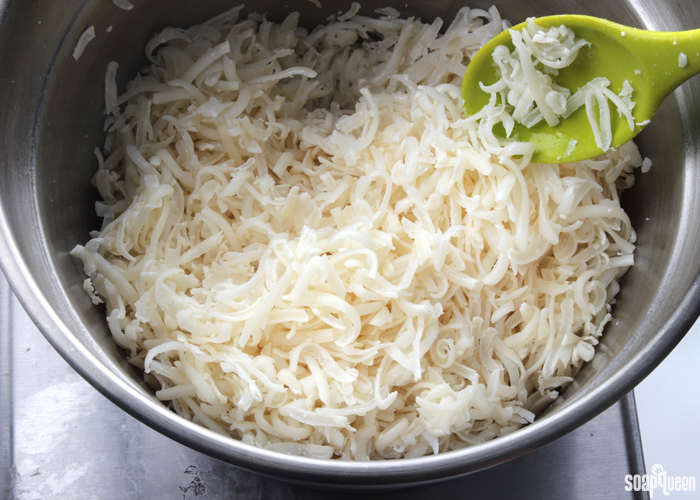 In a crock pot or double boiler, heat the Basic Rebatch and 4 oz. distilled water over low-medium heat until it reaches the consistency of mashed potatoes, stirring frequently to ensure the soap heats evenly. Be patient, this process can take a while! Set aside 10 embeds (5 of each color) to apply to the top of the soap. Once the soap is smooth and soft (it will still be quite thick) turn off the heat. Add the fragrance and essential oil blend and stir until completely mixed. Add the remaining melt and pour embeds and stir to fully mix them into the rebatch. 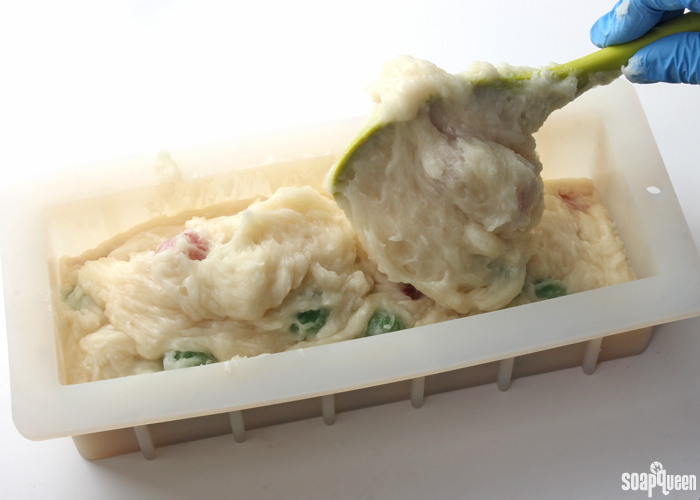 Using a large spoon or spatula, begin adding the rebatch into the 10 Inch Silicone Loaf Mold. After every few additions of soap, tap the mold firmly on the counter to help evenly disperse the soap and get rid of any air pockets. Continue adding the soap until the mold is full. Use the spoon to mound the soap toward the center of the mold. If any embeds are showing, press them down further into the soap. Once your happy with the top, sprinkle the top of the soap with Snowflake Sparkle Mica. Place the 10 embeds that were set aside earlier into the center of the soap. Press them down firmly, as this will prevent them falling off the soap later on. Allow the soap to stay in the mold for 4-5 days. Once it’s ready to unmold, cut into bars and allow the soap to cure for at least a week. This allows the moisture to evaporate, creating a harder and longer lasting bar. Enjoy! I tired this recipe last night using a crockpot. The problem is that some of my embeds melted as I was stirring them into the mix, the rest melted completely inside the mold. Was my soap base too hot? I cooked it to the consistency recommended but by then it was too hot to keep the embeds solid. Sounds like the base was just a bit hot when the embeds went in. The LCP Clear Melt and Pour Soap has a melt point of about 120-125F, so you want your rebatch soap to be about that temperature when the embeds are added. If the soap is a bit too hot, you can turn the Crock-Pot off a wait a couple minutes for that base to cool down. Then, add the embeds and they should stay solid! Hi. We have the medium and not the small mold – oops. How many embeds would you suggest? Also, if I wanted to keep to all natural fragrance would I use 2 ml peppermint EO? I presume the color blocks are not natural though nor is the mica so we haven’t decided yet. Finally this is our first crock pot project – what size do you suggest? Our fragrances are synthetic, so if you want to use just the Peppermint Essential Oil you can! I think 2 mL will be plenty, as peppermint oil is fairly strong. If you want it a bit more fragrant, you can add another couple of mL. That mica sure does look nice on the top! Can it be made with cp only? Cold process batter for both embed and base? 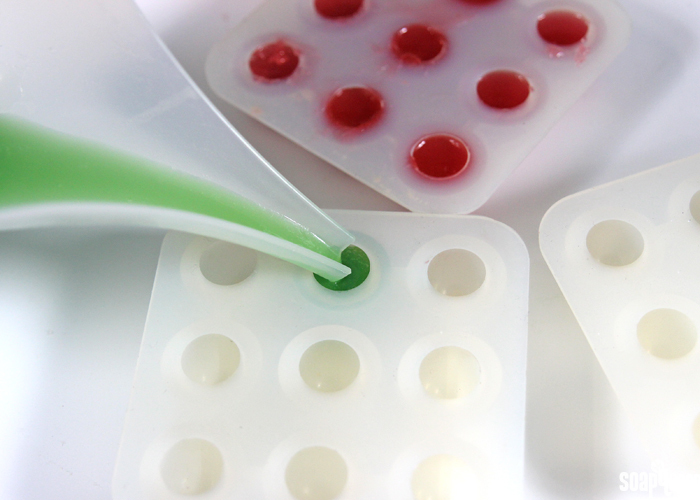 I would recommend letting the cold process embeds fully cure for up to 4 weeks before embedding them in the base. That will ensure there is no excess moisture in the embeds that gets into your base. I am curious, why do you say to leave soap in the mold for so long? Most of the time mine is ready to unmold within 24 hours, and I’ve seen similar comments on the soaping facebook groups I’m in. I wondered if there is some benefit to leaving it in the mold for several days?